He knows when you've been sleeping, and he also knows just the perfect lighting with which to capture a landscape. 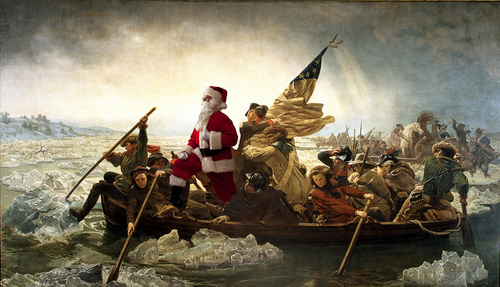 Artist and photographer Ed Wheeler has always felt that a good number of classic artworks are missing something very crucial — an appearance by Santa Claus. So he put together a series in which he dresses up as Father Christmas and corrects the imbalance himself, often with humorous results. Once a painting is selected, Wheeler embarks on a multi-step process to fully integrate Santa into the lighting, brushstrokes and tonal values of a particular painting. The lighting in the studio must match that of the original artwork: this is critical to maintaining the fidelity of the original. Wheeler’s meticulous attention to detail, lighting and relationships between figures lead to another kind of art experience. An exhibit of the collection just recently finished a stint at bahdeebahdu in Philadelphia this past Saturday. The images are also available as a series of Christmas cards at the Philadelphia Museum of Art shop and online store, so you can start your holiday shopping for 2014 super early if you’re so inclined. Check out some examples of his work in this gallery below. Our favorite is definitely “Le Déjeuner Sur L’herbe,” because nothing says “Christmas” like a naked French impressionist picnic. Hooray for geeky Christmas sweaters!